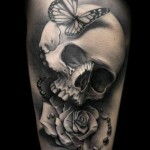 When you see a skull tattoo you immediately assume that it symbolizes death, but death is not the only meaning of a skull tattoo. 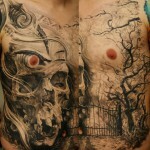 This type of tattoos are very interesting tattoo designs because they have several meanings, from death and darkness to protection, power and overcoming obstacles. 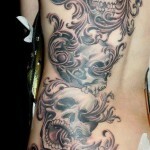 Skull tattoos are like a reminder to live life to its fullest because at some point we all die. 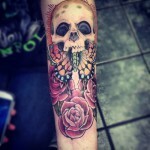 Do to the different meaning of the skull tattoos, the variety of colors and therefore the styles, skull tattoos are not only for men as you can see women inked with skull tattoos. 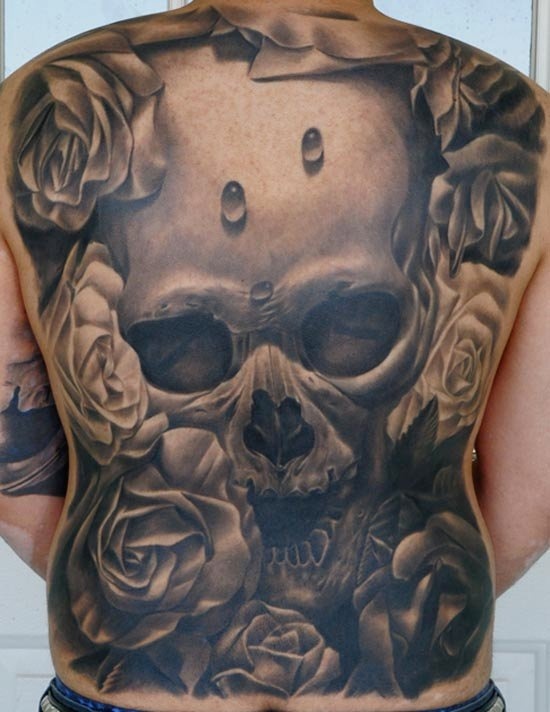 The first image that comes to your mind when thinking about skull tattoos is the design of the skull and crossbones, that represents death or danger. 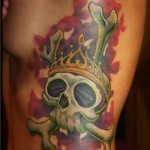 As mentioned before skull tattoo meanings can vary from culture to culture. 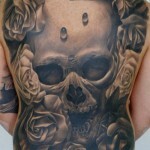 In Christianity, skull tattoos represents eternity, the human remains after the soul left the body. In Kabbalah, the skull represents rebirth, a reason to celebrate not to mourn. In the same vein, death it’s not always something negative; it can be positive if you choose to celebrate and remember those who passed away. In Mexico, the skull is a symbol of a popular festival, where the dead are honored. 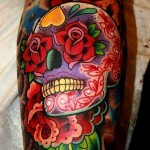 Sugar skull tattoo: represents the Mexican holiday Day of the Dead, when you celebrate the life of friends or family members that have passes away. 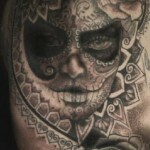 The meaning of the sugar skull tattoo, also known as the Mexican skull tattoo or Day of the Dead skull tattoo, symbolizes a tribute to a loved one lost. 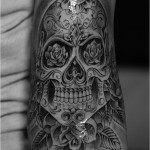 As part of the celebration, skulls are made from sugar and candy and Many people have embraced the meaning of the Mexican skull tattoo making it one of the most popular skull tattoo design. 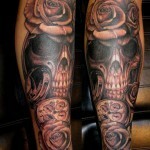 Skull and rose tattoo: it’s a popular design of tattoo. 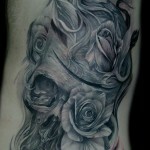 The skull and the roses represents two opposite things, it can be the contrast between life and death; beauty and ugliness. 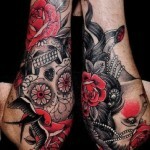 It’s a symbol of duality, with a strong meaning for the person who choose this type of design. 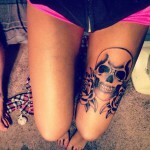 Girly skull tattoo: skull tattoo are not just for guys anymore. 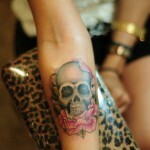 Girls who choose to have a skull inked, may choose a more feminine skull tattoo design. 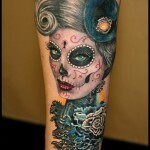 The girly skull tattoos designs are most of the time colored and some additional elements like colored bows, are included in the final design making it a quirky look. can you please leave credits for all the tattoo artists involved? 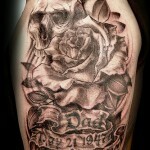 A very good idea Gio, we will try to find the tattoo artist for every tattoo design we post. Also, we are working on a V2 for the site that will come very helpful on this matter. I know this is a few months old. 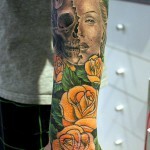 But the marilyn monroe tattoo thats half skull half her with the rose and quote on the thigh. Does anyone know who the artist is? Hello, I’ve seen very well informed on the subject. 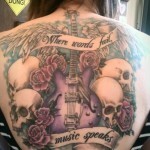 I would like to ask you a question: could you tell me the meaning of any symbol in a skullcandy tattoo? 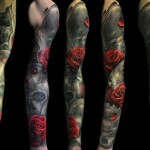 I would like to get a tattoo, and I would like to customize with picture that have a real meaning for me. I would like that is not equal to many other photos stored in the internet.